Over the past 12 months, a lot has been said of email becoming a one-to-one channel, with many industry evangelists crying out to marketers to start segmenting a little more, and claiming that spray and pray senders will be perceived as nothing more than spam. But did we manage to successfully communicate the severity of the situation and the benefits of change, as an industry? I’m not so sure we did, and Groupon is a prime example of a brand that would greatly benefit from this. Groupon is a business growing in popularity by the day. I think we all assume that the company has an enormous marketing budget (they took a slot at the Superbowl commercial break after all), so money can’t be so tight that they could be severely limited to the basics. All options should be open and available to them. Let’s not forget that this is a business that relies entirely on email to inform people of their offers on a daily basis. Last month at the eCircle ConnectEurope Conference in London, I asked over 150 marketers: “How many of you are signed up to receive emails from Groupon?” and almost everyone raised their hand. I then asked, “who receives two or more emails from Groupon in quick succession?”, and all of them raised their hand again. I then asked, “how many of you find the content to be irrelevant or of little interest on most occasions that you receive these emails?” and nearly everyone raised their hands again. My final question was: “Raise your hand if you would be more likely to stay subscribed and engage with emails from Groupon, providing that they give you the opportunity to tell them what you are interested in, and they then sent you relevant offers based on this alone”, and again, almost everyone raised their hand. It doesn’t matter how good the deal is, if it’s teeth whitening and you don’t have teeth, you’re unlikely to be interested, right? The one thing that Groupon has failed to do is ask questions and adapt the conversation accordingly. Apart from name, email address and local city, Groupon doesn’t ask us any other questions and therefore doesn’t have a great understanding of our interests. This means that everyone’s getting the same information all of the time and a lot of that information won’t be of interest to a lot of people. And I do understand that the whole point of Groupon is that it’s daily deals and they’re gone when they’re gone, but I don’t think anyone wants to hear about every single offer, every single day. We should all hopefully believe that relevance is key for brands in developing long-term relationships with people. The good things that happen as a product of this are invaluable. Trust and loyalty earned through meaningful relationships full of relevant conversations is in an ideal world, where we all want our eCRM strategy to be. And it is a complete fallacy amongst marketers that this is difficult to achieve. There is so much you can do with little budget and little time. Groupon could so easily transform the inbox relationships they have with people that would truly benefit them and the people they are trying to engage with. Sometimes, results from email campaigns can be deceiving. I’ve consulted numerous clients in the past that are clearly driving high revenues and return on investment through email, but fail to see that it is not realistically sustainable because brand buzz alone won’t hold this. It’s highly probable that Groupon are getting a great return on investment from their email programme, but if that is the case, I doubt that it can be sustained if it doesn’t quickly adapt to meet or exceed the expectations of the people they are conversing with. Over time, the sheer volume of irrelevant content will overshadow and undermine the content that individuals are interested in, losing loyalty and credibility and therefore making it much less likely that people will open, click and purchase something. So it’s time for change. I’ve already said that you don’t need a large budget to make the greatest changes, and the same is kind of true with strategy. I often find that the simplest ideas are the best ones, and a great starting point for Groupon would be to introduce the ability for people to be able to set their preferences when they sign up. Even if this was just set for top level categories such as spas, eating out, experience days, health care and so on, the positive impact on the relationship would be massive. Content would always be on topic, which would increase engagement, breed long-term loyalty and result in many more conversions. It would also be cheaper in the long-run, because these changes would inevitably result in send volumes decreasing, and there could even be a simple business rule in please to ensure that each recipient only receives one email a day, with all relevant offers included in that one message. And if there aren’t any offers available for some people on one day, be bold and don’t send them anything. Wait until you have something relevant to speak about. The decrease in volume and the potential cost saving associated to that, may even help to build the business case for change because it would pay for itself as a project in the long-run. I’m sure that Groupon has many ideas on how they’ll evolve their contact strategy through email, but I think at present it falls way short of the expectations of its fans. There are so many brands out there in the same situation, but even if email campaigns are driving revenue and high return on investment, if you are not listening to each individual you and adapting your conversation accordingly, it’s unlikely to continue to perform for you at that same level for any length of time. What do you think Groupon can do to improve its email marketing? The difficulties tech companies, particularly in the Silicon Valley area, are having recruiting engineering talent, has been attracting lots of attention lately. For technology companies of all shapes and sizes, people are a huge asset, and that means recruiting is crucial to a company’s success. Unfortunately, recruiting the right people who are going to help your business grow and succeed can be difficult under most circumstances. Yesterday I attended Econsultancy’s Digital Cream event, which we host annually, and which brings together around 300 client-side e-commerce brains together for a day of intense knowledge sharing. 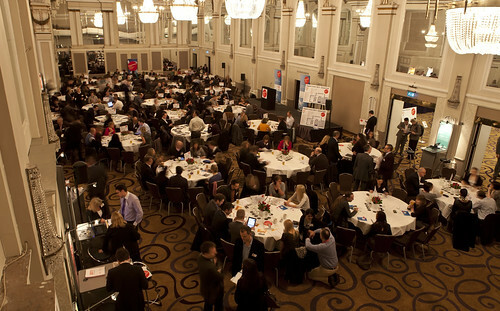 The event format is based on roundtables, which are a core part of our staple diet. We’ve been running roundtables since I joined Econsultancy back in 2003, and they inform much of the best practice insight that underpins our research. They are incredibly helpful. Digital Cream is essentially roundtables on steroids… there are more than 20 of them, in one day. I have a few takeaways from the event that I’d like to share. By all means add yours in the comments section underneath this post, or let us know if you blog about the event, as Simon Lilly and Nick Allen have done. Our thanks to all who participated. Before we begin I should probably mention a couple of similar events, which are are free to attend for client-side folks. Firstly, there is Peer Summit 2011, which takes place in New York in early June. Secondly, there is Digital Cream Dubai, which is our first big event in the Middle East and takes place on 12 April. Do sign up if you’re local. It is important for brands to make the unsubscribe process as easy as possible for recipients of marketing emails, but is it possible to pre-empt this and re-engage them with your emails? I received an email from HMV today, and this suggests that the retailer is trying to make its emails more relevant to customers. So is this an approach that will prevent customers from unsubscribing?